A convertible note can be issued by a startup business to raise seed finance. The convertible note is effectively an interest bearing loan which is eventually repaid by the issue of new equity to the noteholder (lender), rather than being repaid in the usual manner with cash. The conversion is normally triggered by an event such as the business seeking additional external equity investment, and the purpose of this convertible note calculator is to show the impact on the capitalization table of the conversion. This topic is more fully discussed in our tutorial on convertible loan notes. The convertible note calculator assumes that the business has already issued a convertible note and is now at the stage where it is seeking additional outside equity investment. Enter the number of existing shares and pre-money valuation of the business. These shares will typically have been issued to the founders of the business. Enter the amount, discount, and cap for the convertible note. The amount of the convertible note should include any accrued interest accumulated on the loan note since it was issued. The calculator works out the conversion values based on both the discount and on the cap, and uses the maximum of these two values for the remaining calculations. Details of these calculations can be seen in our conversion loan notes tutorial. The convertible note calculator calculates the percentage shareholding, number of shares, and value held by the investor, noteholder, and founders of the business, following the conversion of the loan note and the injection of the additional investment. For additional information, the calculator also shows the share price paid by the investor and the noteholder. Due to the effect of the convertible note discount and cap, the price paid by the noteholder will usually be less that that paid by the investor. The calculator also shows the effective discount on the share price that the noteholder receives. 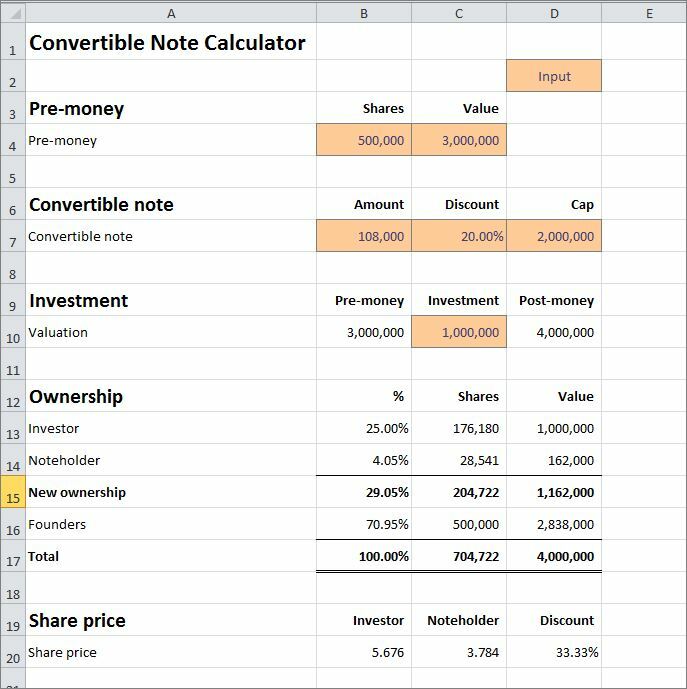 The convertible note calculator is available for download in Excel format by following the link below. Users use this convertible note calculator at their own risk. We make no warranty or representation as to its accuracy and we are covered by the terms of our legal disclaimer, which you are deemed to have read. This is an example of a convertible note calculator template that you might use when preparing financial projections in Excel. It is purely illustrative of a small business accounting calculator. This is not intended to reflect general standards or targets for any particular company or sector. If you do spot a mistake in the financial calculator, please let us know and we will try to fix it.